Geilo is located in the Hol municipality of Norway. During the winter months from December to April Geilo becomes a family friendly Ski Resort with 40 runs ranging from beginner to expert. The uncrowded slopes in Geilo coupled with the northerly location make it ideal for people looking for a snow sure skiing holiday suitable for the whole family. The resort facilities in Geilo are well managed and the flood light coverage in the resort allows for some good night skiing after the short winter days. 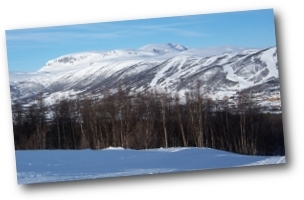 The accommodation in Geilo comprises mainly of the hotel and apartment. The style and quality of Geilo's accommodation is on par with what's expected from modern ski resorts. In fact it is the location of some of Norway's more luxurious style holiday homes. More information on the accommodation options available at Geilo ski resort can be found on our Accommodation page. During the summer months Geilo lives up to it's duties as a National Park Village. There are plenty of activities available to Geilo's summer visitors including hiking, biking, wildlife watching and much more. In fact everything you would expect from a national park holiday. More information on the summer activities in Geilo and the Hardangervidda & Hallingskarvet National Parks can be found on our Summer activities page.